Prints which are invisible will emit fluorescent glow on exposure to uv lamp narrow and broad wavelength – stamping and printing inks. Our vast experience helps us engage in the manufacture of premium-quality Invisible Inks. They are made using high-quality raw materials at our modern infrastructure facility and are highly acclaimed for their durability. They are otherwise called magic inks. They allow the user to write messages without even leaving a trace. 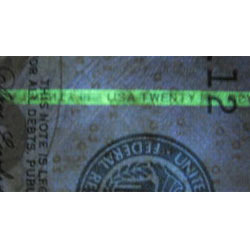 Prints which are invisible will emit strong fluorescent glows when irradiated with infrared wavelengths 750 to 100 nm - also visible inks which fluoresce under similar exposure. - Suitable for paper, cardboard, pretreated PP and PE and other plastics. Suitable for pure cotton fabric pieces. Printing - drying-hot treatment 150 degree Temperature for 2-3 minutes. Gloss, Good adhesion, low temperature curing, well printable, non-sticky surface. 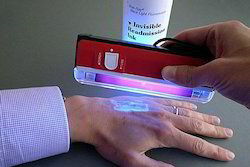 Matching up with the exact requirements of customers, we are involved in presenting wide array of Invisible Ink.